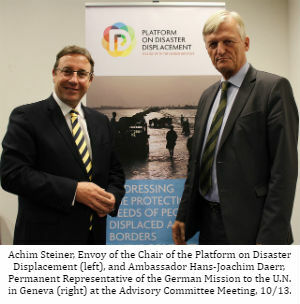 Last week, I attended the Advisory Committee Workshop of the Platform on Disaster Displacement in Geneva. The Platform is the successor to the Nansen Initiative – a state-led global consultative process aimed at identifying effective practices and building consensus on normative standards for the protection of persons displaced across borders in the context of disasters and climate change. The Nansen Initiative culminated in the Nansen Protection Agenda, which was endorsed by 109 governmental delegations (including the U.S.) last year. The Platform was created to follow up on the work started by the Nansen Initiative and to implement the recommendations of the Nansen Protection Agenda. It is governed by a Steering Group of states, currently directed by Germany; an Advisory Committee, which includes the Sabin Center as well as a variety of governmental, non-governmental, and academic stakeholders; and a Coordination Unit, which supports all aspects of the Platform’s activities. Promoting policy coherence and mainstreaming of human mobility challenges in and across relevant institutions and processes, such as the UN Human Rights Council, the International Organization for Migration, the United Nations Framework Convention on Climate Change, the Sendai Framework for Disaster Risk Reduction, and the New York Declaration for Refugees and Migrants. Promoting policy and normative development at national and regional levels to address legal gaps in the protection of persons displaced across borders. I participated in a working group that focused on this fourth priority: promoting policy and normative development to address legal gaps. People who are forced to leave their country as a result of disasters, climate change, or environmental degradation do not enjoy any special status or protections under international law. The UN Refugee Convention provides important protections for refugees – the most notable being the principle of non-refoulement, which asserts that a refugee should not be returned to a country where they face serious threats to their life or freedom – but most people who are displaced due to environmental phenomena, such as floods or sea level rise, do not qualify as “refugees”. (A refugee is a person who has been forced to flee his or her country due to a well-founded fear of persecution for reasons of race, religion, nationality, political opinion, or membership in a particular social group.) Internationally displaced persons are, in theory, protected under international human rights law. But the existing human rights jurisprudence does not answer important questions about the obligations of receiving states with respect to such people. Indeed, international law does not explicitly address a number of key issues, including: whether and under what circumstances displaced persons should be admitted to a country, what rights they have during their stay, and under what conditions they may be returned to their country of origin. The Nansen Protection Agenda provides recommendations on how states might address these issues, but these recommendations are non-binding. Recognizing that countries are unlikely to successfully negotiate and ratify a new international agreement on the protection of displaced persons in the near future, the Platform is focusing on addressing legal gaps at the regional and national levels. Our working group identified two types of activities that could be undertaken to support legal and policy development at these levels. First, the group determined that it would be necessary to gather additional information about the existing legal framework in certain regions. Many countries have enacted laws concerning the humanitarian protection of persons who are displaced across borders as a result of sudden-onset disasters such as floods and earthquakes, and these laws typically provide for the admission and temporary stay of such persons until they are able to safely return to their country of origin. The Nansen Initiative published a study of Latin American humanitarian protection laws, policies, and practices in 2015. Our working group determined that similar mapping exercises would be helpful for Africa and Southeast Asia, where there are significant gaps in knowledge about these laws and how they are implemented. Second, for those regions where the legal landscape has already been surveyed, the group determined that it would be most helpful to support the development of bilateral and regional compacts aimed at reducing mobility barriers and improving access to services and labor opportunities for displaced persons. For example, in the Americas, the group identified two regional organizations to target for the development of regional frameworks on disaster displacement: (1) the Regional Conference on Migration (RCM), an intergovernmental forum of eleven countries in North and Central America that is devoted to sharing information and promoting dialogue on migration, and (2) Mercosur, an economic and political bloc of five Latin American countries seeking to improve foreign relations and free trade. The next step of this process is to submit the recommendations developed by the Advisory Committee working groups to the Coordination Unit, the Chair, and the Steering Group, which will then make final decisions about the Strategic Framework 2016-2019 and accompanying workplan. The Sabin Center intends to continue to support the implementation of the strategic framework in the years to come. Additional information about the event is available here, and a video about the event is available here.